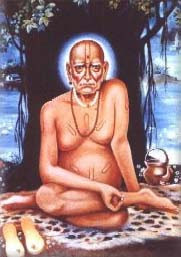 Swami Samarth is believed to be an incarnation of Sri Dattatreya and is a very popular saint in Maharashtra. it is the prakat din or birth anniversary of the holy Saint. Swami Samarth Jayanti 2019 date is April 7. He lived at a place named Akkalkot near Solapur in Maharashtra from 1856 AD and attained Samadhi here in 1878 AD. Nothing much is known about his early days. Swami Samarth Jayanti is annually observed on the Chaitra Shukla Paksha Dwitiya day – second day during the waxing phase of moon in Chaitra Month. There are some striking similarities between the lives of Swami Samarth and Shirdi Sai Baba. Swami Samarth performed numerous miracles during this life time and his devotees even today continue to experience his miracles. His teachings are simple and inspired the common people who came in contact with him. His philosophy was – Harm no one, provide joy to every one. Inside every one, I am the only One.